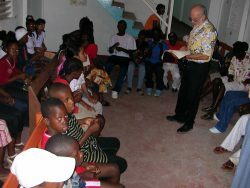 Twenty-eight Americans worked in Guyana, South America, under the direction of Partners In Progress, conducting a medical clinic for 4 days at Stewartville with the assistance of local Christians. One thousand ten patients were examined and treated. Nearly every patient was taught the Gospel and given religious literature. Hundreds of Bibles were distributed. Maximum attendence at the nightly preaching service was 250. Twenty people obeyed the Gospel. The West-Ark Church of Christ takes seriously the biblical command to teach all people everywhere the Good News of the sacrifice and resurrection of the Son of God. 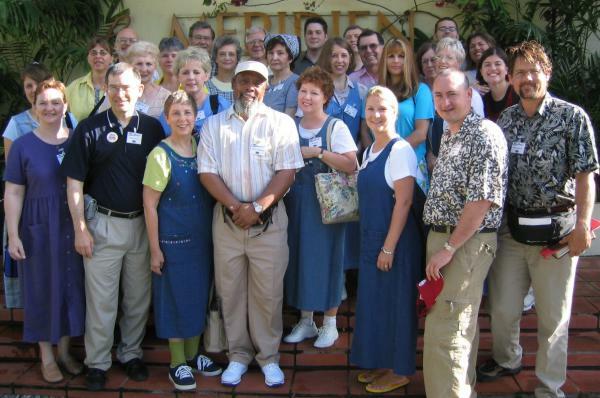 In June of each year since 1991, we have sent an evangelistic medical team to Guyana, South America. Many thousands of people have been taught about Jesus Christ while waiting to receive medical attention. We began preparing many months in advance for this year's trip. Team members were recruited and money raised. Cost from Fort Smith this year was $2,285 per person. There were 21 of us (plus family) who arrived at the Fort Smith airport at 5 a.m. on Saturday, 5 June 2004. Northwest Airlines check-in counters opened about 5:20 and we began the process of checking in our personal luggage and supplies. Our plane departed for Memphis shortly after 7 a.m. In Memphis two more people joined the group for our flight to Miami, where the full team of 28 assembled for our flight on BWIA to Guyana. After a short stop in Barbados, we were on our way to Georgetown, where our plane landed by 8 p.m. No one's luggage nor any of our supplies were lost. After the long drive into the capital city, we were treated with snacks and refreshments at the Pegasus Hotel. We were all checked into our rooms shortly after 10 p.m.
On Sunday morning we met at 8:00 for the breakfast buffet and announcements. We departed in three vans for Stewartville at 9:15. The drive through the market place was fascinating. In spite of rain it was a colorful and busy area, slowing traffic to a crawl on a major street in Georgetown. About 10 o'clock we arrived at the village of Stewartville, where we met with local Christians, many of whom were friends from our work at Leonora in 1994, 1995, and 1996. We sang till nearly 11 a.m. Roy Dunavin then reminded us of how Ezekiel prepared to serve God. The congregation's usual minister, Basil, preached about mercy. We dismissed about 12:30 for the return to our hotel. After lunch we spent 1½ hours counting and packing pills for use in our pharmacy. For the past three years we have used a basic formulary of about 30 medications that cover the vast majority of the health problems we find. Durbin in England ships these medications to Guyana, costing us around $50 per team member. We stock enough in each clinic pharmacy to see an estimated 1,000 patients. The formulary is simple enough that we do not have to recruit a pharmacist for the team (though we would love to have one). This year, as in the past, we used a registered nurse to dispense medications that were ordered by our doctors. At 5:30 on Sunday afternoon, our team members attended a reception with the hotel management staff. Then at 6 o'clock we were served supper. Steve DeLoach, the in-country missionary and leader of Operation Guyana for the last 13 years, spent 1½ hours giving us his orientation presentation. We heard about rules for effectively running the clinic and about cultural differences between Guyana and the States. 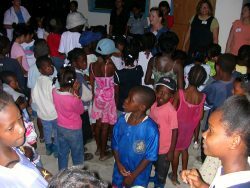 Our medical mission group was the 102nd team which the DeLoaches have directed in Guyana since 1993. After "Steve's Rules" meeting, we divided into two groups to discuss the Bible teaching and the clinic operation with those involved in those aspects. We were finished by 9 p.m.
During breakfast on Monday morning we were encouraged by Richard Bullard's devotional thoughts to not be nervous on our first clinic day in the village. He reminded us that our job is to simply tell about Jesus. We don't have to pressure anyone; the power is in the Word. We left for Stewartville by 7:45 to reach the bridge over the Demerara River before it closed to traffic. Promptly on arrival at the church building, everyone quickly got to work unloading supplies and setting up the clinic. The congregation has used their building for similar clinics in past years, so we wasted no time trying to figure out how to arrange everything. The clinic was ready for patients around 9:30. The Bible teachers, doctors, nurses, and eye specialists all worked inside the auditorium. We quickly adjusted to the noise from many voices, as well as the traffic sounds. The weather was tolerable with a couple brief showers, but mostly sunny with the temperature between 84° and 86°F. The humidity was very high. We closed the clinic a little early, having admitted all the patients in line by 2:30. Having to share the clinic space with the evening preaching service, we had to secure all our supplies before depature. There were 90 patients given attention for their eye problems and 107 patients were examined and treated by our two physicians. Five were baptized throughout the day. Vans began returning our people to the hotel as soon as they completed their assigned tasks. The third and last van departed the clinic site about 3:45. After supper we returned to the church building in Stewartville. 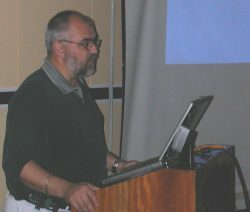 Roy Dunavin preached. Jeannie Cole, with help from a few of our ladies, taught the children. There were 76 adults and 75 children in attendence on our first night. Looking forward to a good night's rest, we returned to our hotel by 9 p.m.
Dr. Younger worked at the Operation Guyana clinic at the hotel each evening. He treated 47 patients there. On Tuesday we saw 261 patients. All patients were invited to study the Bible while waiting to be treated. Only a small percentage decline to study. Everyone was treated with the same kindness whether they sat through a Bible lesson or not. David and Jenna Dickey celebrated their 2nd wedding anniversary on Tuesday. Cake and ice cream were served in their honor after supper at the hotel. On Wednesday, 9 June 2004, a journalist from the British Broadcasting Corporation (BBC) accompanied us to the clinic, sitting beside team director Michael Cole during the 45-minute trip to Stewartville. He is on a 4-month assignment, working on a documentary about the Guyana government. He spoke with most team members, asking lots of interesting questions. He sat with Jeannie Cole while she conducted two Bible studies. We seem to have left a favorable impression of our work. Dolton Duplechan preached to the crowd early in the day as they were standing in line at the gate to the clinic site. An 86-year-old widow in Stewartville told us she was without family and only received an $11 monthly pension from the government. The monthly average salary in Guyana is US$200. It was much lower than this when we first started taking mission teams to Guyana in 1991. We saw 283 patients and 6 people were immersed on Wednesday. The church building in Stewartville is one of the few in Guyana with a baptistry. Upon returning from the clinic, Dr. Michael Cole accompanied Operation Guyana director Steve DeLoach to the Ministry of Health. We found the Minister of Health very attentive to our concerns about several issues related to the medical mission projects of Partners In Progress. 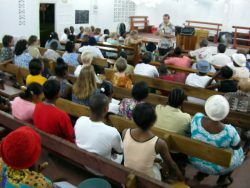 Following the evening sermon on Wednesday night, Roy Dunavin answered Bible questions from several Guyanese at Stewartville. On Thursday morning a BBC crew followed our vans to Stewartville. 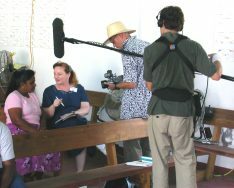 They filmed every aspect of our clinic and interviewed several Guyanese as well some on our team. Their six-part documentary is expected to air in the U.K. in about a year. Though it was the rainy season in Guyana, there was not enough rain this year to interfere with our work. The high temperature was 88°F at the clinic site on a couple days. We stopped seeing patients one-half hour earlier on our final clinic day. In packing up, everything was divided between what returned to the States and what supplies we left behind in Guyana to be used by future teams or by the permanent Operation Guyana clinic. After the truck was loaded, the team climbed into three vans and we returned to the hotel. 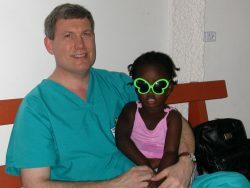 As always, we were excited to complete the medical mission project, but it is with mixed emotions. We are happy that we are closer to returning to our loved ones in the States, but we're sad to leave behind our new friends in Guyana. In the evening we made our final trip back to the church at Stewartville. We taught Bible lessons to 49 teens and 120 younger children during the preaching by Roy Dunavin. With the clinic setup removed from the building, we had space to divide the children into younger and older classes, permitting age-specific teaching. The BBC camera crew filmed some of our singing and preaching on Thursday evening, as well as portions of our two classes for children. It did not seem that the filming caused but a minor distraction to all in attendance. We said our final good-byes to the people of Stewartville. Breakfast was at 8:00 on Friday. We were ready to depart for the airport at 9 a.m. when we were informed that our flight was delayed by five hours. The hotel allowed us back into our rooms to await later transportation. We ate lunch at the hotel at our expense. Arriving at the Georgetown airport at 3:00, we were quickly checked in and through security. Since our flight was delayed, BWIA provided complimentary sandwiches and drinks while we waited in the departure lounge. Several minutes before boarding the plane out of Guyana, one of our team members passed out. In spite of all the excitement, he was soon walking onto the Boeing 737. During the flight he experienced another fainting spell, causing the pilot to request an ambulance to be at the plane on arrival in Trinidad. It was a challenge for our two doctors to convince the airline to allow him to continue on with us. After changing planes in Trinidad we traveled to Barbados. We were met at the airport, from where we were bussed to the Bougainvillea Beach Resort. We arrived there at 10 p.m.
Everyone had a fun day in Barbados on Saturday. We departed on schedule. Changing planes in Miami and Memphis, we arrived back in Fort Smith around 8:30 p.m. We enjoyed seeing the big crowd of family and friends welcoming us home. We thank God for providing a safe trip. It was our desire to demonstrate God's love to those we served and to do all to His glory. Our prayers are with the Guyanese we left behind. Missy Blasdel, L.P.N., Michael Blasdel, David Brightwell, Jill Brightwell, Richard Bullard, Shirley Bullard, Jeannie Cole, Michael Cole, M.D., David Dickey, Jenna Dickey, Joyce Dunavin, R.N., Roy Dunavin, Shawn Dunavin, Dolton Duplechan, Colleen Frost, Jane Gregory, Jim Hardin, Robin Harper, Nancy James, Glenda Lewis, Jack Lewis, Mary June Lewis, R.N., Robertta Moses, Charlotte Pinedo, Jill Roberts, Mary Jo Russell, Jeannee Wilkerson, R.N., Steven Younger, M.D.